Editor’s note: You may have missed this article when CMI first published it. We’re sharing it now because businesses need to put content strategy before editorial planning today more than ever. “I got this content strategy thing,” you may think. You know your voice and tone, you know what formats and channels you’re going to create content for, and you know how often you’re going to publish or share content. Don’t get me wrong. 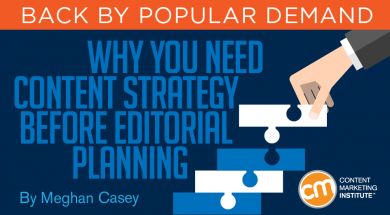 Content marketers need an editorial plan, especially if they’re regularly creating new content. At the same time, you need to figure out lots of other things before you plot your content ideas on a calendar. Enter — you guessed it — content strategy. 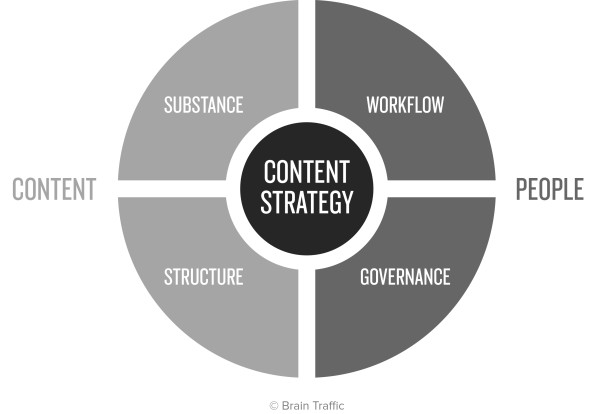 What is content strategy, then? Not the right content. If your content isn’t right (not useful or irrelevant) for the people you hope to reach, those people won’t read it — let alone act on it. Not the right times. If you don’t understand your audiences’ questions or tasks, you don’t know when they need your content. What are the content objectives? To convey the value of a core content strategy statement, I have a story for you. A year ago, I interviewed a client stakeholder during the discovery phase of a project. His team was responsible for SEO, including creating content to drive search traffic to the company’s website. The client was a large retailer that sells, among other things, pet food. I asked a question about SEO. The following (paraphrased) conversation ensued. Henry Ford once said, “Thinking is the hardest work there is, which is probably the reason why so few engage in it.” Sadly, that SEO consultant wasn’t thinking. He or she probably wasted thousands of my client’s dollars. That “black cat” SEO strategy might have temporarily boosted my client’s search rankings, but it probably didn’t boost cat-food sales or cause black-cat searchers to buy my client’s cat food in the future. If only a core content strategy statement had guided the SEO effort (an example statement is coming, never fear! ), my client could have created meaningful content that could have boosted its search rankings and helped. One of the primary functions of content strategy in general, and of a core content strategy statement in particular, is to help organizations say no to content ideas that fail to serve the audience or the business — ideas that put tactics before strategy, like optimizing for “black cat” at Halloween in a misguided effort to sell cat food. Let’s walk through an example that puts strategy before tactics. In the sections below, I generate and refine some content ideas for a meal service I use called Origin Meals, which sells fresh-cooked meals based on the paleo diet. In this walk-through, we’ll consider all the questions that a core content strategy statement answers (see the list above), but instead of having a statement to guide us, we’ll bump along without one, taking one question at a time. I think that you’ll find this walk-through a helpful — if protracted — way to appreciate the value of a core content strategy statement (and to appreciate the statement example when I finally get to it). We believe a healthy diet should be full of real food, packed with nutrients, and free of potentially irritating ingredients that don’t serve the functions of your body (in short, a paleo diet). Knowing only what it sells and its mission, I brainstormed a bunch of content ideas that could drive awareness and promote its products. This image shows the resulting list. Nice little list of cool stuff that could be done. Which ideas should we choose to develop? It’s a safe bet that not all of these ideas will appeal to the target audience, so next we need to consider that audience. They believe in the paleo philosophy. They eat paleo when they have time to cook and prep meals. They work out regularly at a CrossFit gym or another small, locally owned gym. What does that information do to our list of ideas? It eliminates the items that will have little appeal for this audience. These folks aren’t looking for tips on going paleo, information on feeding a family paleo-style, benefits of eating paleo, or other information for people new to eating paleo. (The next image shows these ideas crossed off the list.) We can’t expect these readers to care about the crossed-off topics any more than we can expect people searching Google for “black cat” at Halloween to care about cat food. Now that we’ve homed in on the content ideas with the most potential appeal for the target audience, we’re ready to consider business objectives. Our original list continues to dwindle, as shown in this image, leaving us with only those content ideas that support these two business goals. Now that we’ve sifted out the content ideas that have the most potential appeal for the main audience and that support business goals, we’re ready to layer on content objectives. Demonstrate how Origin Meals helps athletes eat to perform. Help athletes choose the meal options that fit their lives best. These content objectives enable us to refine our three remaining topic ideas, as shown in this image. Bummer, you might think. All that effort, and we have only three ideas to show for it. In fact, three strategically sound ideas beat a slew of ideas that fail to connect with your target audience, your business goals, and your content objectives. Still, it did take a lot of effort to arrive at these three ideas. Enter, at last, the core content strategy statement. What if we had had a core content strategy statement from the start? Might our initial list have looked more like what we ended up with? Probably. Core content strategy statement: At Origin Meals, we help increase new and recurring orders by creating, distributing, and managing motivating content that shows busy, single, paleo-minded athletes how Origin Meals fits into their lifestyles. Try it for yourself. Brainstorm some content ideas based on this core content strategy statement. Of course, as we saw earlier in our process-of-elimination brainstorming exercise, you don’t need a core strategy statement to come up with good content ideas that support an organization’s mission statement, business goals, target audience, and content objectives. I find, though, that distilling those fundamental bits of information into a memorable statement helps in a couple of ways. First, it helps get stakeholders on the same page. Second, it gives content creators an easy way to remember what kind of content they want to create and why. For more tools to help you develop a core strategy statement and use it to make content decisions, see Keep Your Content On-Strategy With This Single Statement [Templates]. Next time you’re brainstorming content ideas, walk through the four-step process outlined here to arrive at focused ideas quickly. Or take a stab at creating a core strategy statement to guide your brainstorm. Either way, put strategy before tactics. You’ll get better results for your business or client — and for your audience. I’d love to hear how you brainstorm your content ideas. Please share in the comments. Meghan Casey is the lead content strategist at Brain Traffic , the world’s leading agency devoted exclusively to content. She helps a variety of clients — start-ups, nonprofits, colleges and universities, Fortune 50 companies, and everything in between — solve the messy content problems most organizations encounter every day. She has also helped The Nerdery, a software-development shop, build content strategy into their user experience practice. Meghan is a trainer and speaker on content strategy topics. She once inspired workshop participants to spontaneously do the wave. Yep, that really happened. She has been working with content and communications since 1996. Her book The Content Strategy Toolkit: Methods, Guidelines, and Templates for Getting Content Right was published by Peachpit in June. You can follow her random musings, some of which are about content strategy, on Twitter @meghscase.